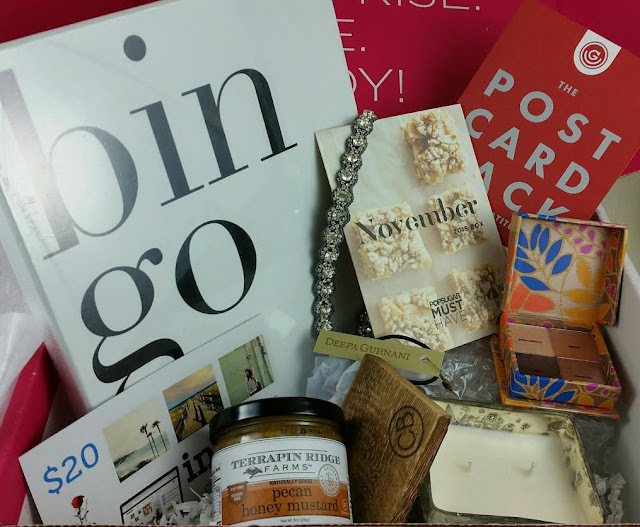 The theme for the November 2015 Popsugar Must Have box revolved around Friends & Family, Gratitude, Gifting and Festivities. Given the contents, I'd say they picked a nice round of products that fulfill most of those words. 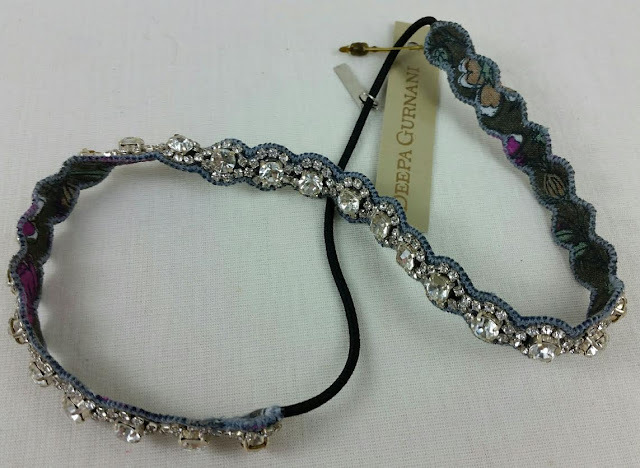 Deepa Gurnani Katie Crystal Headband- This is super pretty and I'm glad its silver because that's what I wear the most. I've actually been getting into wearing slim headbands like these so having another one to add to my collection is fun. I like the crystals and the backing keeps it from sliding back and popping off. I have problems with that kind of thing. My head is fairly small and this headband is aaaalmost a little bit too big. I should say that. These are handmade in India and are pretty pricey. 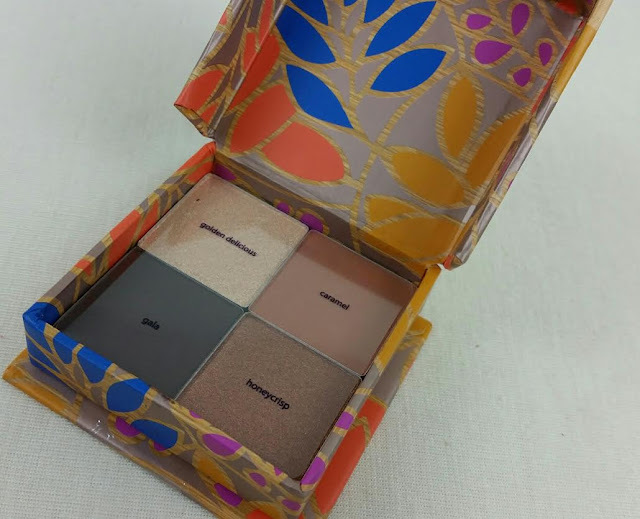 Tarte Cosmetics Beauty and the Box Eyeshadow- Four Tarte Eyeshadows in a super cute box! This is labeled "Apple of My Eye" and the shadows all have apple names. Golden Delicious is a gold glittery shadow, caramel is a slightly auburn brown matte, Honeycrisp is a bronze shimmer and Gala is a dark brown matte. I can't wait to use these! West Emory Bingo Set- At first I was like... Hm... And then I realized that it's in here because people spend a lot of time with their families over the holidays and sometimes it can be boring. 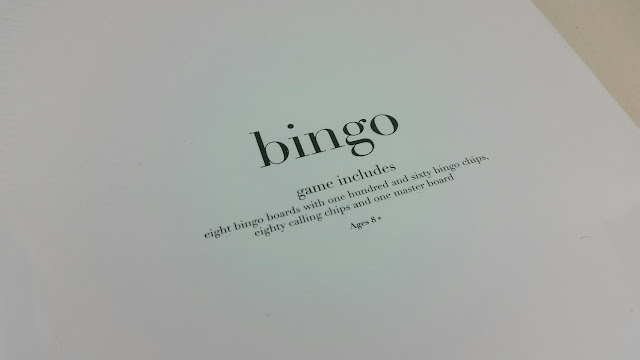 Well, now there's Bingo to spice up your life. We have so many people in my family that something like this would go over really well. I'll bring it. Capri Blue Mercury Jewel Box in Rain- This is a candle that can be used as a jewelry holder once the candle is burned. It has a recycled glass container with a wooden lid. It's cute! I'm not loving the scent, though. 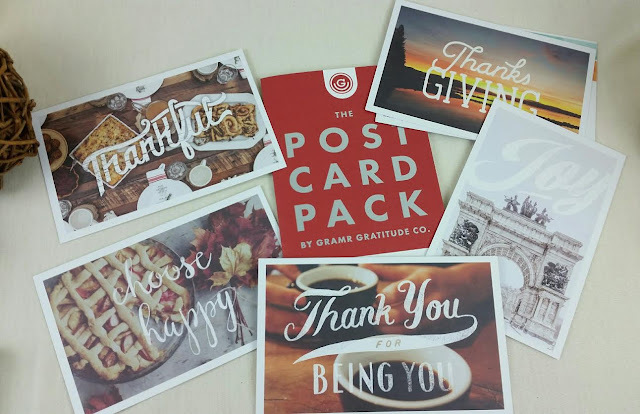 Gramr Gratitude Co. Thanksgiving Post Card Pack- Gramr showed up in last years November box, too. These are heavy cardstock and nice enough that I might frame a couple of them. If I do it fast enough, I could send these out this year. Terrapin Ridge Farms Pecan Honey Mustard- This is a dip! Popsugar always includes some food item and I think this is a good one. Especially for the holidays. I think I'll take this to Thanksgiving with me and serve it with pretzels like they say to. Or maybe with cheese... Hm. Or both! 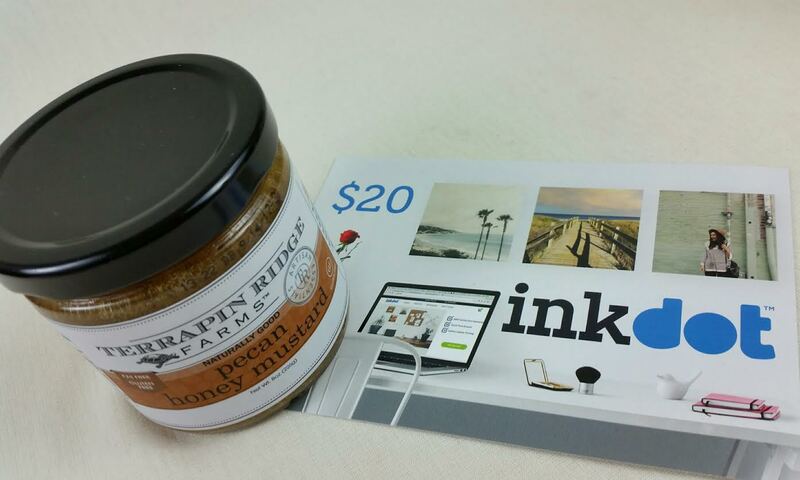 Inkdot Gift Card- This $20 Gift Card is a special extra and doesn't count toward the value of the box. It's good for turning digital photos into prints, coasters, iPhone cases, etc. Hm. I'm not sure I'll use this. VERDICT: Popsugar is one of my absolute favorite boxes. I love that it's a little bit of everything. I get so many beauty boxes that it's refreshing to open a box with home items in it. I thought this might end up being kind of a boring box but now that I have it, I'm enjoying the contents. Plus what I won't use will make excellent gifts. Woohoo! If you would like to sign up for Popsugar, you can do that right here. When you do sign up, use code MUSTHAVE5 or REFER5 to get $5 off your first box. I don't know if I have a defective candle " box" or not.. The exterior has multiple white dots which look black-ish in some lighting. I know the company says this is mercury glass, which I am quite familiar with as I have an extensive collection of Adler and Christopher Radko Christmas ornaments and other brands which are much less expensive and they are mercury glass too. BUT- not even the ones that a relative purchased for me many years ago as gifts every Christmas have any spots in the coating of the glass and I've never seen this flaw before now. 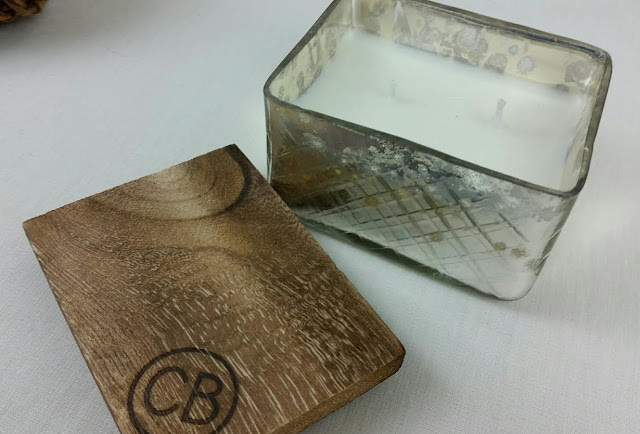 Does your candle box have multiple spots in the surface? The bottom of my box is fine- of course. To me, this is a huge flaw based upon my experience with mercury glass, but then again, it is an inexpensive item considering the large amount of scented wax inside. I hope you and some others with this box can address the issue with me. I hate to complain to PSMH, but if mine's defective, then I want an exchange or replacement. I got two boxes (one for gifts) and both candles have those same dots you are talking about. So I think it's normal. I have no clue about mercury glass so I wouldn't be able to say whether it's quality or not. I just think it's quaint. I don't like the candle smell but I do want the box so I guess I have to burn it.